The Institute International Andreï Tarkovsky has provided this update [PDF, French]. An English translation follows. Note that both books are in French. and showing clearly the address where to receive the books. Two books together - 3.48 euros. Further to our previous news update on the series of Tarkovsky films being screened by Swedish Television (SVT), note that Chris Marker's Une journée d'Andrei Arsenevitch [ screenshots ] is being shown on 21 November at 14:00, and 25 November at 23:30 — more details here. Thanks to Per Ybo, Daniel Stenvall, and Lars N. Clement Bertelsen for the tip. Those Swedes are really on the ball! A new article on Tarkovsky, by Thorsten Botz-Bornstein, appears in the latest issue of the online journal Film-Philosophy (vol 8). Access the article directly, here. as well as details on the current activities of the Andrei Tarkovsky Institute. 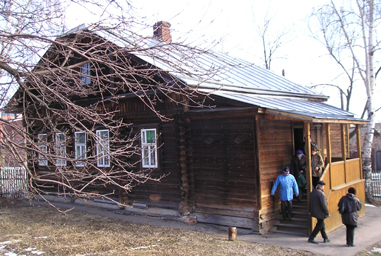 Friends of the AndreiTarkovsky Institute. President of the Friends of the Andrei Tarkovsky Institute. to see many of you there! Call 01 47 03 12 50 to make reservations. 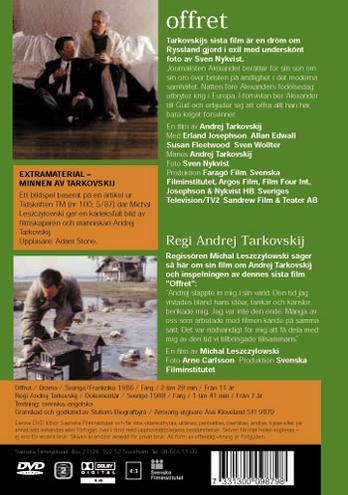 Swedish Television (Sveriges Television) is screening a series of three Tarkovsky films, starting this Tuesday: Andrej Rubljov Tuesday 16/11 at 22:30; Stalker, Tuesday 23/11 at 22:30; and Nostalghia, Tuesday 30/11 at 22:30. More details here. Thanks to Lasse U. for the heads-up. 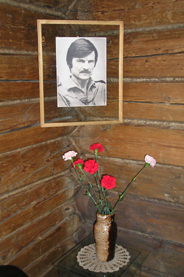 Both Andrei Tarkovsky and Victor Erice are referenced in the paper A Comparison between Asymmetric Japanese Ikebana and Symmetric Western Flower Arrangement. Thanks for Gonzalo B. for the pointer. 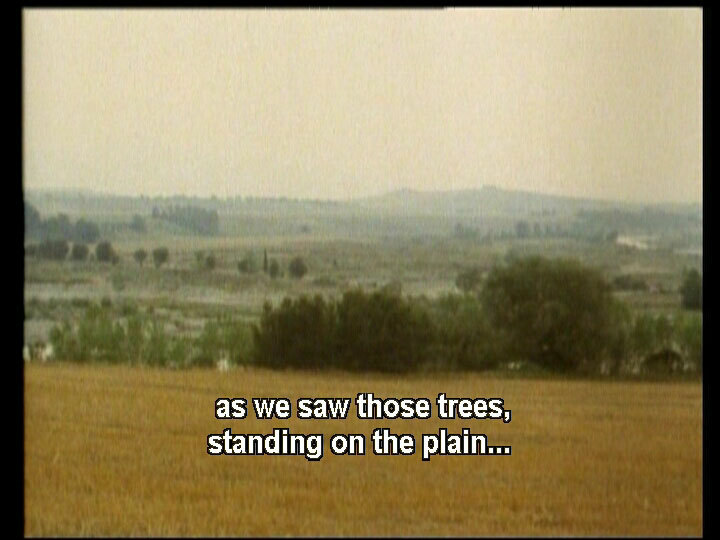 We recall how Erland Josephson indeed refers to the tree in The Sacrifice as an ikebana. An Ikebana Master once confirmed to us that the tree was created precisely according to the ikebana tradition: you may see Heavens, Earth as well as Man represented. Further, Sato Kimitoshi explains in his fascinating paper What the Japanese Tree Tells Us (presented at the 6–8 December 2002 Athens Tarkovsky Conference) that it was Tarkovsky himself who made the ikebana, by nailing a big branch onto the tree, and that the form of the ikebana adheres exactly to the Rikka style. And he suggests that, perhaps, he needed the branch as a gesture, signaling his reverence for Japanese culture. Food for thought. Dave Feltenberger recently wrote us a nice note, and included in a "P.S." a link to a paper he wrote during his undergrad days. The paper deals with the theme of nostalgia in Tarkovsky's films — read it here. We have been informed by David Maguire, London, that this year's Christmas card from the BFI/NFT is a still from Mirror. The text on the back of the card reads "Cover image: Mirror (Zerkalo) screening in a retrospective dedicated to Andrei Tarkovsky at the NFT in March 2005." Stay tuned for further details on the upcoming National Film Theatre (London) retrospective. Site visitor Thorsten Botz-Bornstein reports that he has completed a new article on Tarkovsky: "Aesthetics and mysticism: Tarkovsky, Plotinus and the Problem of 'Grace'", published in Transcendent Philosophy (UK) 5:4, Dec; 2004. This information has been added to our Bibliography section. 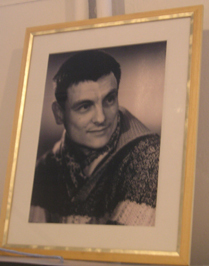 Also, please visit Thorsten's website, where you can find another article on Tarkovsky. Have a look at this photo gallery by Nikita Pavlov. 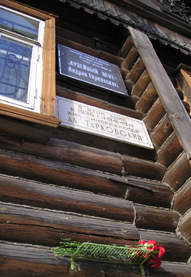 Andrei Tarkovsky's house, proudly demolished by the City of Moscow. See our June 29 newsbrief for some background information. Further to our October 11 news update on the cycle of five lectures on Andrei Tarkovsky to be held at Praguet Klub P.M.S (Czech Republic), the main lecturer at all five events will be Vladimir Suchanek, a 1979 graduate of VGIK. 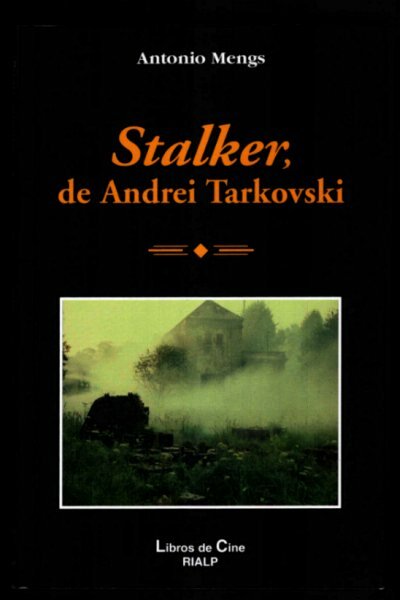 During his time at VGIK, he attended Andrei Tarkovsky's lectures (these were limited-admission lectures) and was also present on the set of Stalker (during G. Rerberg's stint), as part of a student practicum. The poster for the Prague event can be viewed here. On October 13, we received from Facets Video screeners of their Tempo di viaggio (Voyage in Time) DVD (R1/NTSC), slated for a November 23 release. The same day, we notified Facets of several problems with the DVD, and recommended that these be rectified prior to official release. We never received a response from Facets, in spite of our follow-up attempts. So, to summarize, there are two main problems with the upcoming release: (a) the subtitles and (b) the PAL-NTSC transfer. Facets have used an incorrect subtitle file. Yes, it's the (by now infamous) file used by Artificial Eye on last year's Nostalghia/Tempo di viaggio release, featuring brilliant exchanges such as this (Tarkovsky chatting with Guerra). When AE was notified of this problem in March of 2003, they immediately responded, and informed us that a discarded file had been accidentally used in the final multiplexing. They identified the situation as "embarrassing" and immediately set out to rectify the problem, for which they are to be commended. It turned out that even the "correct" file, while not suffering from the above faux pas, did have certain deficiencies and Nostalghia.com were able to advise them on several points. (The final version of the subtitle file has not yet been released on disc by AE, as their disk-set re-release is on hold, pending locating an acceptable audio track for the main title of their disc). It would be a great shame if Facets released Tempo with such inferior subtitling, especially considering the promptness of AE's reaction, and the fact that a perfectly good file is in existence. There is also a serious problem with the PAL-NTSC transfer. This problem is, in the case of this disc, much more severe than in some other cases we have discussed (e.g., here, and here), and must be rectified before we can possibly recommend this disc to our readers. You may wish to write Facets [ Telephone: 1-800-532-2387 / 1-773-281-9075 ] to (politely) voice your opinion, preferably prior to the release date. The below is an abbreviated version of our October 13 letter to Facets. The comments pertaining to subtitles are an exact copy of those we sent to Artificial Eye... 1.5 years ago. Got the DVDs today, [...]. [We'll] register here two major objections. 1. THE SUBTITLES ARE WRONG. Donatella Baglivo documentary on the making of "Nostalghia"). give you an idea of how bad things are. English subtitles should use the film's English name: "Earth". 18:27 - "There is practically no action going on in Antonioni films". 36:10 - Again, change "fiction" to "science fiction". science-fiction details" or perhaps "...from the fantastic details". 36:29 - "Stalkin" should read "Stalker". 2. THE VIDEO APPEARS TO BE A PAL-TO-NTSC TRANSFER WITH DISTRACTING ARTIFACTS. technique that bottom of the barrel home multi-system VHS VCRs do. to watch, especially with scenes filmed from a moving car. 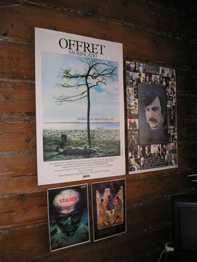 In connection with the Festival Temps d'images (Paris, France), all of Andrei Tarkovsky's films will be screened during the period October 12 to November 23. On November 12, a new book will be presented: Andrei Tarkovski: Récits de jeunesse, containing, among other things, poems and short stories from AT's youth, some inspired by his geological expedition journeys to Siberia. This material is published for the first time ever. Translated into French by Cécile Giroldi, edited by Philippe Rey. On November 23, a new French edition of the Tarkovsky Diaries will be published by Cahiers du cinéma (paperb., 500 pages, ISBN 2866423739, 28.50 Euro). This re-release of the Diaries is expanded by 100 pages of additional material. Again, edited by Philippe Rey. As part of the Temps d'images festival, a theatrical stage play, Solaris, directed by Martin Wuttke, will be premiered. 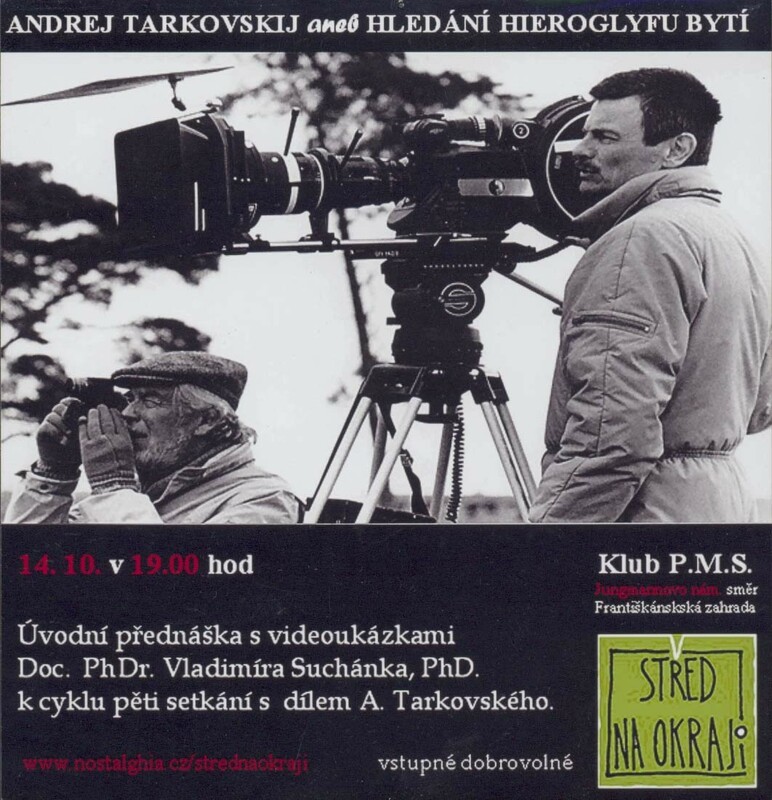 Our colleague, Petr of Nostalghia.cz in the Czech Republic informs us of a cycle of five lectures on Andrei Tarkovsky which will be held at the Klub P.M.S. in the center of Prague, between October 2004 and February 2005. The first lecture will take place on October 14, the topic being Andrei Tarkovsky himself. The four subsequent lectures will focus on the films Mirror, Andrei Rublov, Stalker, and The Sacrifice, respectively. Further details (in Czech) may be found here. 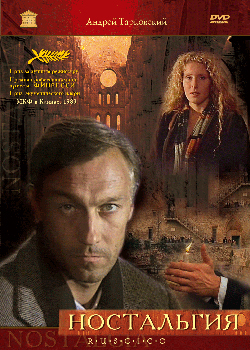 Nostalghia.cz also reports that a 2xDVD set of Andrei Rublov (RusCiCo) is slated for an October 12 release in Hungary. It is the 178 min. version, with Russian and French DD 5.1, as well as Hungarian and Russian DD 2.0 audio (finally an original mono soundtrack on this RusCiCo title). English and Hungarian subtitles. Special features are, filmography, photo gallery, documentary from the set, and an interview with Jurij Nazarov. Andrei Tarkovsky's Tempo di viaggio [ credits ] (Voyage in Time) is slated for a November 23 DVD release from Facets Video, USA. The DVD is in NTSC format, Region 0. Included with the DVD is a booklet featuring an interview with Tonino Guerra about his relationship with Tarkovsky, plus an essay by Italian film critic Alberto Crespi. MSRP is $29.95. The ArcLight Cinemas and the 7th Annual Arpa International Film Festival (Hollywood, USA) will be screening Parajanov: The Last Spring, which features a poetic chapter on the friendship of Sergei Parajanov and Andrei Tarkovsky. Before the screening, Russian Academy Award-winning filmmaker Mikhail Vardanov will mention Andrei Tarkovsky in his tribute speech commemorating Sergei Parajanov's 80th Anniversary. The event is expected to be videotaped and photographed for possible inclusion as bonus material on the film's DVD release (Criterion, 2005). Tickets for the 12:15pm screening on Sunday, 10 October 2004, may be obtained at the theater's box office at 6360 Sunset Blvd in Hollywood or at arclightcinemas.com two weeks in advance. The following just in from Iceland. Film critics/writers who wish to contribute to this interesting (English-language!) project should contact Þorkell directly at the email address given below. Dear News desk at Nostalghia.com. First I want to thank you for your website. I visit it every week. professor of theology at the University of Iceland. imagery in his films and on his relationship with Iceland. project then please contact thorkell@gmail.com. The results of our 3rd Anniversary Draw (see August 1 newsbrief) are in. First prize (Polaroids book) goes to Rick Maddocks. Second prize (and/OAR Tarkovsky tribute CD) goes to Jeff Iblings. Third prize (Cinema Classics: Tarkovsky CD) goes to Matthew Buzzell. Congratulations! Thanks to everyone who participated — the response was overwhelming. The correct answer was "Andrei Tarkovsky and Valerio Zurlini, 1962". 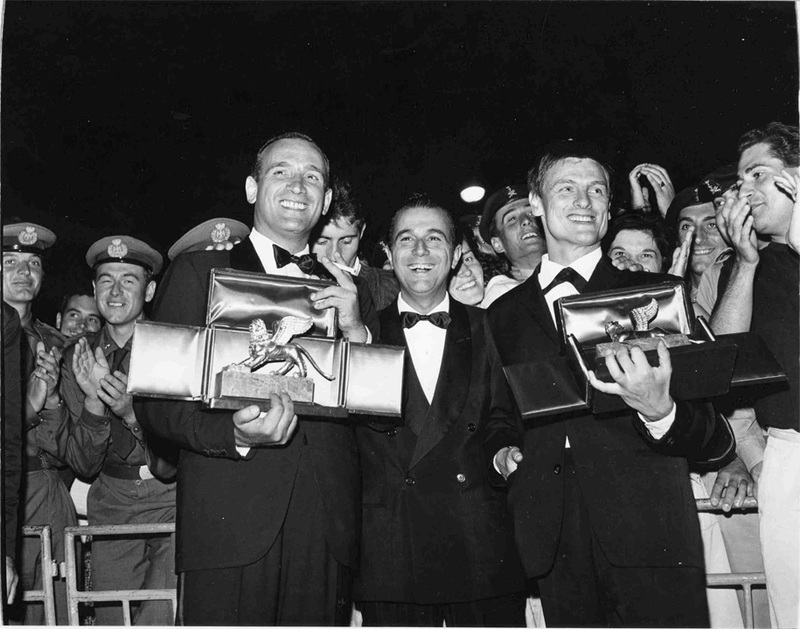 The photo was taken September 8, 1962 at the Venice Film Festival, where Mr. Tarkovsky and Mr. Zurlini tied for the Golden Lion award. 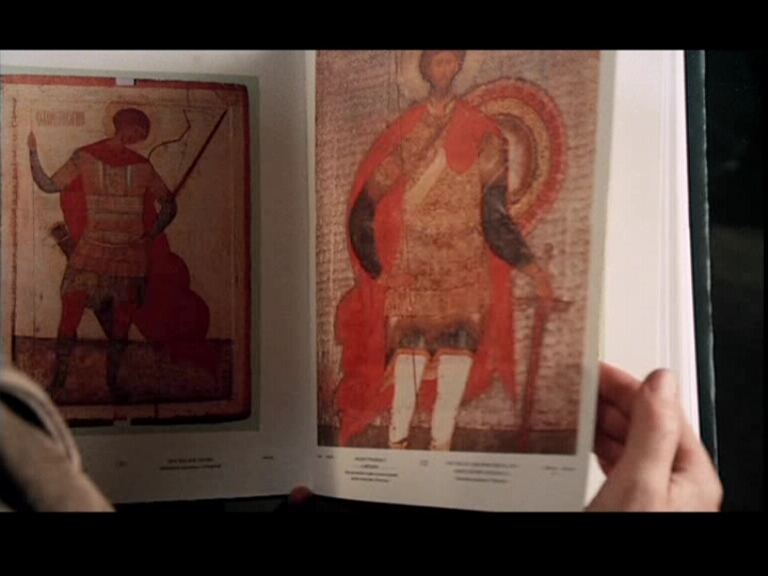 We take a very preliminary look at the colors of the Mosfilm-restored Andrei Rublov (see earlier news stories) here. Follow the DVDBeaver link therein to see Gary Tooze's DVD comparison. Solaris (the 1972 version) is mentioned in this article. A new impressive theoretical work by Florian Sprenger (in German), entitled 1+1=1, has been archived here (PDF, German). Regarding the recent DVD release in Russia of the Mosfilm-restored Andrei Rublov [ cover scan ], site visitor Andrei Diment brings some potentially good news: "this is a very satisfying release indeed. Restoration work was done very well — no film damage evident, contrast and brightness are well balanced. 16:9 anamorphic picture shows a great deal of detail, with frame being considerably wider than on any of previously released DVDs (revealing additional image parts). Not as sharp as Criterion, but still very nicely done DVD. There are two sound tracks: 5.1 remix and original mono, both are clean of hiss, pops, etc. It comes in a nice 2xDVD set (film and extras on separate disks). No English subtitles. The 174 min (PAL-speedup) 'official' version." Watch for upcoming DVD review on the hopefully soon-to-be-relaunched DVDBeaver.com. We have received some complaints pertaining to the subtitling of the restored Andrei Rublov now screening in the U.K. The subtitles are apparently often very hard to read against lighter backgrounds. This is somewhat surprising, considering the existence of readily available modern laser technology. Furthermore, subtitles include — we are told by several sources — jarring American slang, along the general lines of "Gee, I've lost my whip!" or "Dude, that's a great bell. Did your poppa tell you how to make that sunuva gun?". Now, if these reports are indeed true, one might ask who on earth authorised the use of such sloppy subtitles, considering the fact that there are several sets of perfectly acceptable subtitles already in existence. Nostalghia.com is celebrating its third anniversary today. Correctly answer the following question by email before 31 August 2004, and you will be entered into our anniversary prize draw. Question: identify the two award recipients seen in this photo, and also tell us what year the photo was taken. A random draw will be conducted on 1 September, 2004. 1st prize: the book Instant Light – Tarkovsky Polaroids courtesy of Thames & Hudson; 2nd prize: the music CD Another Kind Of Language: dedicated to Andrei Tarkovsky courtesy of and/OAR; 3rd prize: one CD-R copy of the now out-of-print (and hard-to-find) Cinema Classics: Andrei Tarkovsky (London POCL-4336, only released in Japan). Good luck! Juan Asensio, author of Essai sur l'oeuvre de George Steiner (L'Harmattan, 2001) maintains a weblog called Stalker, wherein he discusses the works of Steiner, Faulkner, Conrad, Bernanos, Rohmer, Sabato and others. He recently posted his article about Tarkovsky's Stalker. Read it here (in French). was nearly full. Unfortunately, it was not a new print. retrospectives even with this print. Russia and his first voyages in Italy. The Association des Amis de l'Institut Andrei Tarkovski have sent us their report from the June 27th General Assembly [PDF, English]. We do encourage you to contact Les Amis (at email address arsenevitch@wanadoo.fr) with your suggestions and ideas—they are especially interested in hearing from young filmmakers, authors, and other artists. Starting Friday July 2, 2004, London's Institute of Contemporary Arts is screening something they describe as a "Restored Print with Dolby Stereo" of Andrei Rublov. More information maybe be found here. Thanks to Wayne and Max for the heads-up. We greatly welcome reports from those of our readers who will be attending these screenings. site from its very beginning. Thank you very much for what you are doing. I consider this case as a shame of my nation and my city. Incidentally, in his column "On Culture" in the Financial Times (26–27 June 2004, pg. W6) Peter Aspden lists Andrei Rublov as one of his two favourite films and notes that it "is soon to be re-released in the UK in a fresh print." He is presumably referring to the recent Mosfilm-restoration. We have yet to receive any firm details on the nature of this restoration effort. Let us hope that nobody has digitally manipulated the patina that Tarkovsky loved so much, and that the original mono soundtrack has been preserved intact. Stay tuned. DVD News: The Lizard label (Russia) is releasing Andrei Rublov in a 2xDVD set. Details here [ large cover scan ]. No English subtitles. The cover says, "Full restoration of image and sound." It sounds like this may be the newly restored version (see March 6 news). The web page states "Dolby Digital 5.1," which is cause for worry. Unless Tarkovsky's original soundtrack is included as well, we recommend that you avoid this DVD. The release of the new Nostalghia 3xDVD Box Set (see January 7 newsbrief) has been pushed back to October due to problems in locating the film's soundtrack. The resident dog at RAI apparently ate the original magnetic sound track (that is our theory, anyway). RAI have only been able to locate the optical track, but it is of unacceptable quality (as clearly demonstrated by the recent, horrendous Artificial Eye Nostalghia release). It is our understanding that investigators in Russia appear to be closing in on what may be a copy of the magnetic track, so things do look promising. But, if you have any information whatsoever on the whereabouts of the magnetic sound track of Nostalghia, please contact Nostalghia.com as this could help speed up the whole process somewhat. Spanish poet Antonio Mengs has written a book on Stalker, published by Ediciones Rialp, Spain. Antonio tells us in an email that, "The book title is "Stalker, the Metaphore of the Path," more or less. It's not an erudite essay, I am a poet and not a scholar: I've tried to reflect my own impressions, specially the way I feel Andrei used the resources of his art to realize the contribution of the spectator, so, on viewing the actors going through a path, he also is searching for his own path. That is, approximately, the main idea. But the way he does so, as I perceive, is above all as an artist, through senses: the impressions of music, ideas, pictorial textures, light, time, are used to take the spectator into the appropriate mood for perceiving the depth of life and human existence, in the same way the stalker tries to do with his 'clients.' [...] Nostalghia.com has been a relevant source of documentation, and is quoted very often in the footnotes." You may find further details on this Spanish book at andreitarkovski.org. 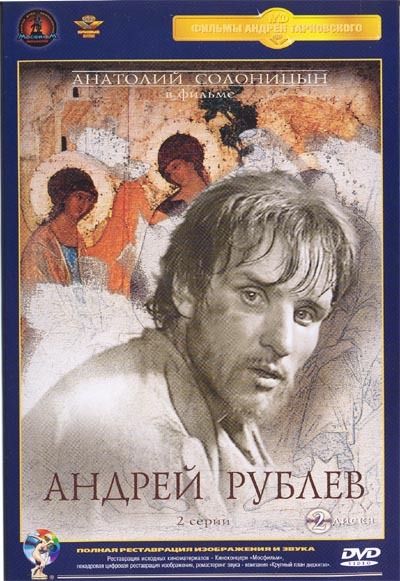 The films Nostalghia [ cover ] and The Sacrifice [ cover ] have just been released on DVD in Region 5 (Russia). These do not have English subtitles, but many of our readers in Russia may find the news to be of interest. Stanislaw Lem, author of Solaris, makes reference to Andrei Tarkovsky (as well as U.S. director/producer Steven Soderbergh) in this recent Mosnews interview. Jim Yasuda of Japan invites our readers to visit his photo gallery website, which contains photos taken by Jim at various locations used in Nostalghia: San Galgano Abbey Ruins, Bango Vignoni, San Pietro church (Tuscania), Calcata (near Rome), Campidoglio (Rome), and the Madonna del Parto (Monterchi). Eric Hynes has written an excellent an article on Stalker, approaching the film from a spiritual perspective. The article, written for a thematic issue of the online film magazine Reverse Shot (Spring 2004), is located here. A nice collection of Tarkovsky-related material on the topic of film editing (transcripts of lectures, FTP zip files) in Russian can be found on this site. Be patient, the server is slow. The Alona Kagan Gallery, New York, is currently hosting the Memory Index (1999-2004), an exhibition consisting of 600 new works by Bill Albertini. This work in progress, which has evolved since 1999, features photographic images derived from Andrei Tarkovsky's Solaris. Bill Albertini: Memory Index, Alona Kagan Gallery, 540 West 29th Street, NYC, April 17 – May 15, 2004. A few not directly related, but still noteworthy links that have been brought to our attention: Cinematic Poetry of Alexander Dovzhenko and Film Director Sergei Paradzhanov's 75th Birthday, both by Olga Bobrova. The following report was contributed by our correspondent Yevgeny Borzov in Ivanovo, Russia. in Yurievets , the place where he was born and spent a few years during the war. of about 20 pictures was on display in a former classroom, where Andrey used to study. husband Rolan Bykov (Buffoon in "Andrey Rublev"), cooperating with the master in the 60s. 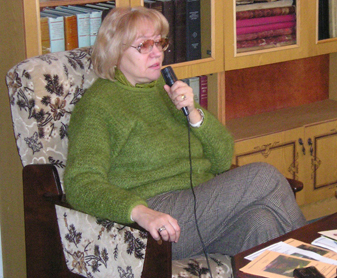 On April 5th a conference "Sacrifice: symbolism and context" was organized in Ivanovo. Thank you for your wondeful site again! A new Sacrifice DVD is slated for release in Spain later this year. It will be based on the new SFI master, i.e., the transfer will be identical to that of the recent Swedish release (see February 6 news). The new disc set will include the bonus materials already found on the Swedish disc: Regi Andrej Tarkovskij, and Memories of Tarkovsky. 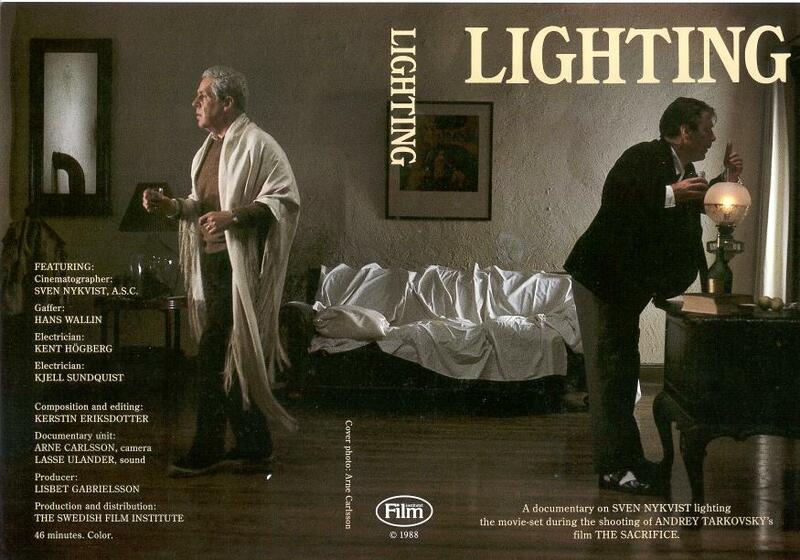 But this is where it gets interesting: at our and andreitarkovski.org's urging, the release will include two of the documentaries the SFI failed to include on their own release, viz., Lighting [ VHS cover ] and Building Images. These have never before been available on DVD. Altogether, the 3 x DVD box will thus contain more than 6 hours of Sacrifice material. Also to be included is a 40–60 page booklet with a detailed Viewers' Guide in Spanish as well as background information and photos. This book will be prepared by Tarkovsky scholar Rafael Llano of andreitarkovski.org (author of the stunning Andrei Tarkovski — Vida y Obra). All DVDs are Region 2 PAL with optional Spanish subtitles. There are no English subtitles, but note that Lighting and Building Images are almost purely visual collages of fascinating behind-the-scenes footage and can be appreciated without any subtitles whatsoever. This DVD box set is being produced by Wanda Vision, the Spanish rightsholder. Gonzalo Blasco of andreitarkovski.org will follow the entire production process (including the DVD authoring itself) very closely. He has been hired by Wanda Vision as a quality control advisor. We commend Wanda Vision on their decision to employ a lover of the film for this job (what an utterly novel idea!). Suggestions and comments are invited; please write to Gonzalo at webandrei@andreitarkovski.org. There is still time to suggest inclusion of additional extras. Regular updates will be posted on Nostalghia.com as well as on www.andreitarkovski.org. This just in from Laura Geronazzo of Ultreya, the original publisher of Luce istantanea. We suggest that you take the book release dates with a grain of salt (see also our March 3 news update). des Mittel- und osteuropaeischen Films. Editeur, Paris under the the title Andrei Tarkovski, "Lumière instantanée". The recent Mosfilm restoration of Andrei Rublov took six months and cost $40,000, according to this article. During the March premiere of the restored film, the Mosfilm director general told journalists that all Andrei Tarkovsky's films will receive the same treatment in the near future, according to the same article. May we call your attention to a series of paintings called Stalking Hiëronymus, influenced by Tarkovsky's Stalker and Bosch's work on the figure of Hiëronymus. The artist is Hans Vandekerckhove of Belgium, and more information can be found here. Thanks to Anneleen Hermans for notifying us. Alex Asp (Solaris Digital Ltd.) sent us the following report. See also our February 25 news column, on the Mosfilm restoration of Andrei Rublov. Mosfilm premiered the restored version of ANDREI RUBLOV on March 2nd. The author still does not say which version of the film has been restored. will be screened in London in the spring, during the "Russian Cinema Days." sound has been remixed to 5.1, although the article does not mention this. also what medium has been utilised for the storage. lot of SATA 250 Gb hard drives - not impossible but IMHO unlikely. images and colors exactly as in the times when those paintings were created." to improve upon the original work of art. For our earlier musings on the RusCiCo fiasco, see the concluding remarks in this article. Let us hope Mosfilm haven't crossed that fine line between restoration and alteration... We will bring you further details as soon as they become available. The British Film Institute (BFI) Publishing will be bringing out a book on Andrei Rublov as part of their Film Classics series (ISBN 1 84457 038 X). Further information is found here. Many thanks to Aidan King of Cornwall for the tip. Frequent site visitor and contributor, filmmaker Sean Martin [ website ] relayed the following response from Thames & Hudson regarding their upcoming release of "Instant Light": "Publication is currently scheduled for 1st June. The book should appear on our website a week or two before that. Yours sincerely, John Hawkins." We suggested in our February 6 update that a German edition of the above mentioned book may be in the works. Site visitor Florian Schiffmann was able to track down the publisher for us: the German publisher is none other than Schirmer-Mosel. The title is Andrej Tarkovskij — Lichtbilder. Die Polaroids. (ISBN 3-8296-0132-8). More information here. 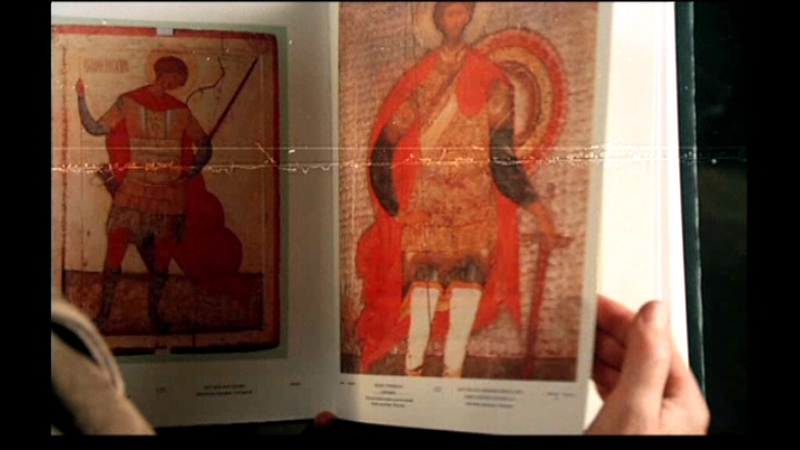 Here are some screenshots from Student Andrei Tarkovsky (Galina Leontieva, 2003). We found this film — which to our great surprise has English subtitles — on the new Russian video release Unknown Tarkovsky (see November 3, 2003 newsbrief). The tape also features the Tarkovsky/Gordon film There will be no leave today (no English subtitles). After Tarkovsky (2003, orig. : Posle Tarkovskogo) is a lyrical piece, a video-essay made over the span of five years by TV journalist and film critic Peter Shepotinnik. A number of people who knew Tarkovsky personally are interviewed, such as philosopher Vyacheslav Ivanov, Vadim Yusov, Oleg Yankovsky, Ignat Daniltsev, Anatole Dauman, Tonino Guerra, Mikhail Romadin, as well as Andrei Tarkovsky's relatives. The film contains excerpts from the personal video archives of Peter Shepotinnik and Chris Marker. The director sent us this informative English-language booklet [PDF]. The Harvard Film Archive in Cambridge, MA is playing host to an Ozu Centennial Celebration from April 2 to May 11 [ calendar ]. Note that Tarkovsky's Stalker is screening amidst all the Ozu, on April 19. Thanks to Matthew Packwood for the heads-up. MOSFILM have just finished their complete digital restoration of Andrei Rublov. A press screening will be held on March 2, with D.P. Vadim Yusov, Mosfilm General Director Karen Shakhnaza, and the restoration team in attendance. The restored audio is Dolby Digital. There is an article in Russian here, which can be automatically translated into English here. The article does not give any details on what version of the film this is (i.e., is this the 185 or the 205 minutes cut?). Let us hope the audio track is monaural,... and that our good friends over at Criterion decide to use this opportunity to plan a reissue of their (non-anamorphic) Andrei Rublov title. Rashid Saffiulin, production designer on Stalker reports that he has opened a gallery website: rashidart.ru. Especially note the kino section, and links therein. Oleg Yankovsky celebrated his 60th birthday on February 23rd. Don't worry Oleg — you don't look your age at all! 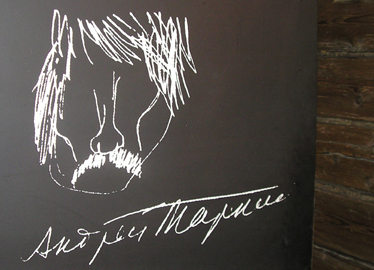 Artist Igor Vladimirovich Sumsky of Volgograd, Russia, sent us a personal and heartfelt work of art in tribute to Andrei to Tarkovsky. He writes, "My friends, I thank you and I wish you happiness for preserving the memory of the remarkable and wonderful artist Andrei Tarkovsky. Please accept as a token of gratitude a small work of mine — a collage. Thank you for remaining faithful to Andrei and his work. Best wishes in all your endeavours!" Thank you for your kind words, Igor. Your collage will find a home in our Tributes section shortly. In our previous update, we reported that Thames & Hudson has released Instant Light: Photographs by Andrei Tarkovsky. It now turns out that the release has been somewhat delayed. There are conflicting reports regarding the actual release date — T&H first reported a delay until March, then April, and now June. Feel free to drop them a line, stating your desire to see the book released eventually. Many of our readers have a deep respect for the works of Chris Marker. Filmmaker Chris Kelly recently sent us an essay he wrote on Marker's Le Tombeau d'Alexandre. Not directly Tarkovsky related, but a fascinating read nevertheless. WE recently received this letter [PDF] from the newly-formed Friends of the Andrei Tarkovsky Institute. Please read it, and support them in any way you can. In this letter they announce, among other things, that a paperback edition of Le Temps scellé is slated for a February release, to be published by Les Cahiers du Cinéma. Also to be published by Cahiers is a revised and augmented edition of Tarkovsky's diaries, Martyrolog. The book of Polaroid photographs Tarkovsky took in Russia and Italy will be published in French by Philippe Rey of Paris later this year. (See our page on the Italian edition of this book, Luce istantanea). An English version of Luce istantanea has just been published by Thames & Hudson. The title is Instant Light: Photographs by Andrei Tarkovsky (ISBN 0500542899); you may find it through, for example, amazon.co.uk. We are also hearing persistent rumors about an imminent German edition — publisher still unknown. We just received the following touching letter from site visitor Tsaly Katsnelson (slightly edited): "Dear Jan and Trond! On December 29, 2003, the sad date of the great movie director Andrey Tarkovsky's death, I started an Internet website in Russian devoted to the movie "Mirror". The URL address is mirror.nyrainbow.com. Why did I create this site? I have lived for 8 years in the USA, and before that almost all my life (I am 66) I lived in Russia. In 1976, there was a screening of "Mirror" in the movie theaters of the city of Kazan, where I lived. The movie shook me. Then I wrote a long essay about this movie and when Tarkovsky came to Kazan in 1980 I handed over to him this essay. "Mirror" has touched my life deeply and I considered it my personal obligation to transfer these feelings to others. Andrey Tarkovsky is the greatest movie director in the world (not local) scale and consequently it is not surprising for me that you two, non-russian scientists, have created a unique site devoted to this person. I am entirely admired with your fundamental work and hope that you would somehow estimate my modest work and consider possible to give a reference to my work on your site, Nostalgia.com. If you by any chance may need my help - I would be happy to make it. Yours faithfully, Tsaly Katsnelson." We hope those of our readers who know Russian will drop by Tsaly's excellent website! Site visitor Maya Han pointed out to us the existence of a new documentary on Arseny Tarkovsky, Arseny Tarkovsky Eternal Presence. 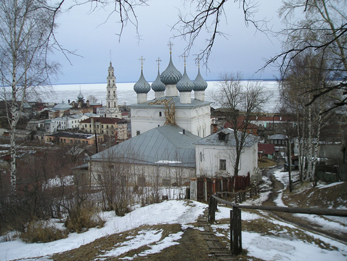 The work is described as a poetic documentary about Arseny Tarkovsky (1907–1989). The director of the documentary, Viatcheslav Amirchanian, cared for Arseny Tarkovsky in the last years of the poet's life, shot many hours of film in that period, took countless photographs and, years later, he combined this with other material to form this documentary. Tarkovsky Sr., who was admired by colleagues such as Joseph Brodsky, Anna Akhmatova and Marina Tsvetaeva, was never published during the Stalin era. The film provides, through the protagonist, a picture of the 20th century in Russia that ended only one year after the poet's death in 1989. Rafael Llano's book about Andrei Tarkovski, the 900-page tome Andrei Tarkovski – Vida y Obra has, well-deservedly, won the prize of the Spanish Circulo de Escritores Cinematográficos (Circle of Cinematographic Writers). This is the most prestigious prize given out for books on Cinema in Spain. Our most sincere congratulations to Mr. Llano! Rafael Llano is the founder of the excellent web-resource andreitarkovski.org. 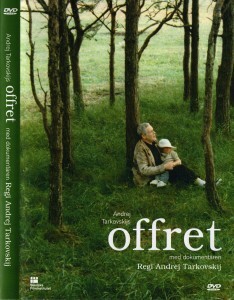 We have received a copy of the Swedish Film Institute's new Offret (The Sacrifice) DVD and have forwarded some pertinent screenshots to our friend over at DVDBeaver.com, and a comparison review was posted there today (here). This is a truly wonderful disc. Image contrast and colors are well balanced and (in our opinion) highly accurate. The audio track is more vibrant than ever. The print used for the transfer is the cleanest print ever used for an Offret DVD. For example, this frame — ruined on all previous DVD versions of Offret — looks like this on SFI's new disc. The only negative aspect we can find about the disc is that it comes in an 1.66:1 letterboxed, instead of an anamorphic, transfer [ letterboxed vs. anamorphic ]. But this is most definitely the disc of choice for those who want the best Offret DVD currently on the market. The always enthusiastic Petr over at nostalghia.cz reports that his Czech review of the disc is found here, and a SFI/AE comparison review is found here. Tarkovsky enthusiast Michal Petricek has written a small program for translating Latin type into the Cyrillic alphabet. It is freeware, and a zipped download is available from nostalghia.cz, here [Windows]. Update: This is for Czech keyboard input - an English version will be written if there should be enough interest. MGM has recalled their Bergman box set, see February 1 and 7 news items on our main MoC site. As someone we know put it, "The power of the filmlover triumphs over corporate stupidity for once." Have a good weekend. The Swedish Film Institute reports that their remastered Offret (The Sacrifice) DVD is indeed on-track for a January 30 street-date, and that it may be ordered through the SFI secure website (Swedish only) or email address filmbutiken@sfi.se (English, non-secure), starting January 30. Site visitor Jesper Larsson informs us that the DVD cover looks like this [ rear ] and that the included slideshow, Memories of Tarkovskij, is narrated by Adam Stone. Expect a full analysis of the disc, once a copy is received at Nostalghia.com newsdesk. For more information, see our November 6 and November 25 newsbriefs, as well as our article The Sacrifice Redux which explains what is wrong with all current versions of The Sacrifice on DVD. The following anecdote was recently submitted to us: "In the early 1980s Andrei Tarkovsky visited the London Film Festival. During his conversation with the audience following the screening of Nostalghia, someone asked him what contemporary Soviet filmmaker he admired the most. The answer came immediately: "Otar Iosseliani!" The response was met with a stunned silence, as no-one appeared to know who he was talking about. Iosseliani's remarkable talent and unique sense of humour was at that time still a well-kept secret — thanks to the Soviet authorities..." Don't forget to read Mikhail Lemkhin's insightful interview with Iosseliani, if you haven't done so already. We have for several years wanted to incorporate some material about Otar Iosseliani on our web site. When our good friend Mikhail Lemkhin today, out of the blue, emailed us an interview he conducted with Mr. Iosseliani a while back, we knew we had hit the jackpot. The interview — which is a must-read! — is called "There is no Return to Anywhere". Mikhail also called to our attention the fact that February 2 will be Mr. Iosseliani's 70th birthday. Further to our October 18 newsbrief on Marina Tarkovskaia and Alexandr Gordon's visit to Spain, here is a brief interview with Marina and Alexandr, conducted by Gonzalo Blasco of the always excellent andreitarkovski.org. Nostalghia.com contributed several questions to this interview. One of these questions pertains to a certain VGIK student work called Konsentrat (Extract). We think you'll find it interesting. We obviously have to revise this page somewhat, in view of the newly uncovered information. A new 2xCD set has landed on Nostalghia.com newsdesk. The title of the CD is another kind of language: dedicated to andrei tarkovsky and contains contributions from some incredibly talented artists who also happen to be passionate about the cinema of Andrei Tarkovsky. This is a very exciting work indeed, please check out the samples on this page. A high resolution cover scan should appear in our tributes section shortly. We have a few more details on the upcoming Nostalghia DVD set (see November 25 news): The film will be presented in a brand new transfer from the very best model of telecine machine currently in production. Tonino Guerra has agreed to make an interview and possibly a commentary track for the DVD. In addition to Tarkovsky's Tempo di viaggio, all three Baglivo documentaries will be included. There will also be an interview with none other than Milena Vukotic. More to come, so stay tuned. While we eagerly await what promises to be a deluxe Nostalghia/Tempo di viaggio DVD set, have a look at our new Diaries thread on the topic of Tempo di viaggio. This material has been carefully and meticulously re-translated from Polish into English by Nostalghia.com with the kind permission of the Editor of the Polish Edition, Dr. Kuśmierczyk. The page contains a level of detail heretofore not found in any English-language version of Martyrolog. Fascinating reading material, sure to be of value to serious researchers. The Institute of Contemporary Arts, London, England, will be screening The Sacrifice January 16 – 19, and Mirror January 23 – 26. To commemorate what would have been Sergei Parajanov's 80th birthday, The Armenian Art History Research & Educational Association is staging a birthday celebration Friday, January 9, at Hollywood Entertainment Museum. Tickets for the celebration, which begins at 7 p.m., include the opportunity to participate in a private exhibition tour guided by Sargsyan and Hollywood Entertainment Museum curator Jan-Christopher Horak. For reservations and further information, call 1-323-823-9352.